To make the sweet and sour sauce sauce: in a saucepan combine the first 5 ingredients until combined. In a cup or bowl whisk the cold water or pineapple juice with cornstarch until smooth and well blended, then whisk vigorously into the ketchup mixture; bring to a boil stirring or whisking constantly over medium-high heat until bubbly. Reduce the heat to medium-low and continue simmering and mixing until thickened (be patient the sauce takes a few minutes to thicken up) remove from heat and allow to sit at room temperature while making the chicken balls or you may cool to room temperature then refrigerate until ready to use (I prefer the sauce at room temperature). To make the chicken balls: in a large bowl combine flour, cornstarch, baking powder, baking soda, garlic powder; add in water and sesame oil; whisk vigorously until smooth. Add in chicken pieces; using clean handsand mix until well coated. Heat oil in a deep-fryer or Dutch oven to 375 degrees. Carefully dip the battered chicken pieces in hot oil and fry until golden brown (about 3-4 minutes). Sprinkle with seasoning salt immediately after frying if desired. 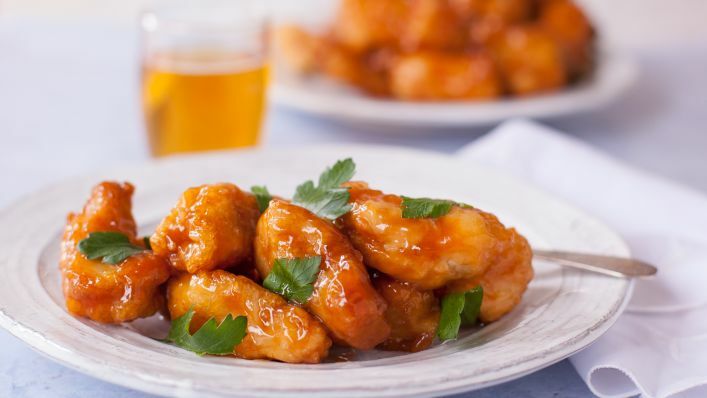 Serve immediately with sweet and sour sauce. Cut chicken into 1 inch cubes. Season with salt and pepper. Dip chicken into cornstarch and coat thoroughly. Dip into beaten eggs. Heat oil in large skillet. Cook chicken until browned. Place in baking dish. Whisk until smooth, then pour evenly over chicken, flipping chicken so the sauce gets on both sides. Bake at 350 degrees for 15 minutes. Turn chicken and cook for 15 more minutes.